(… actually it wasn’t, because I didn’t get this post written in time for that. It was still twenty years ago this month though). 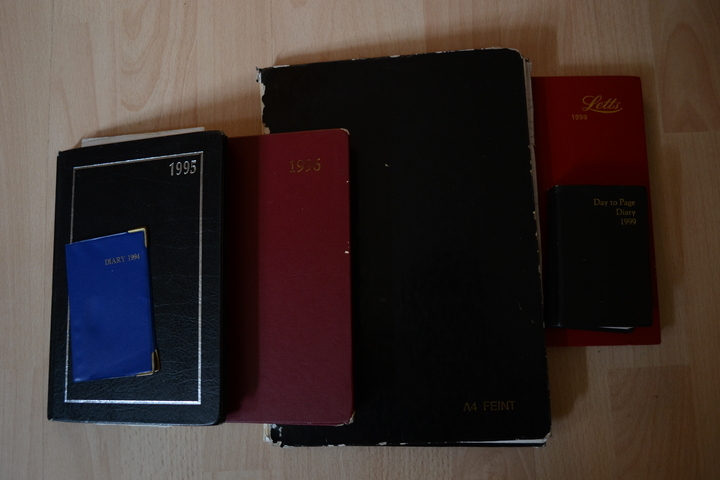 I’ve kept a diary ever since the start of 1994. I can’t remember exactly why I started… I think I’d been given a little blue diary for Christmas and rather than use it for keeping track of appointments and all that boring stuff, I decided I was going to write down what happened every day in it. (I didn’t have many appointments to keep track of back then anyway. I was 14. All of my weeks were basically the same as each other). It wasn’t actually the first time I’d decided to do this. I also tried to do it in 1991 and 1993, but both times I only got a few weeks into the year before abandoning it through laziness. 1994 was the first year I actually managed to keep it up for a whole 365 days, to my slight amazement. But by the time 1994 rolled to a close, it was firmly established as a part of my life. Even only a few months from the beginning, I was finding it interesting to be able to look back and see what I’d been doing every day. 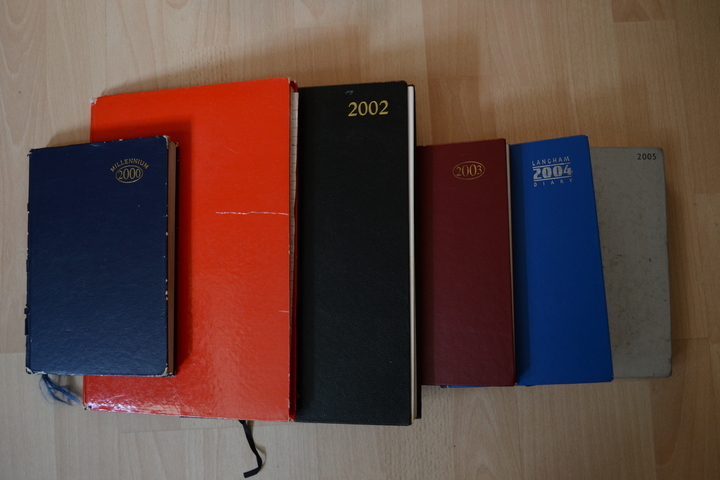 For 1995 I bought a much bigger diary (A5 two days to a page) and started writing in much more detail – I had been starting to get frustrated by the lack of space in my 1994 one. I’ve essentially kept doing the same thing ever since. I’m not even 100% sure what I’m doing it for, but after this length of time it would feel really weird to stop. For most years I wrote the full 365 or 366 entries; the only one that’s missing more than a few is 1998. My clinical depression was at its very worst then and even living through the days once seemed bad enough, never mind reliving them for the questionable purpose of writing them down. 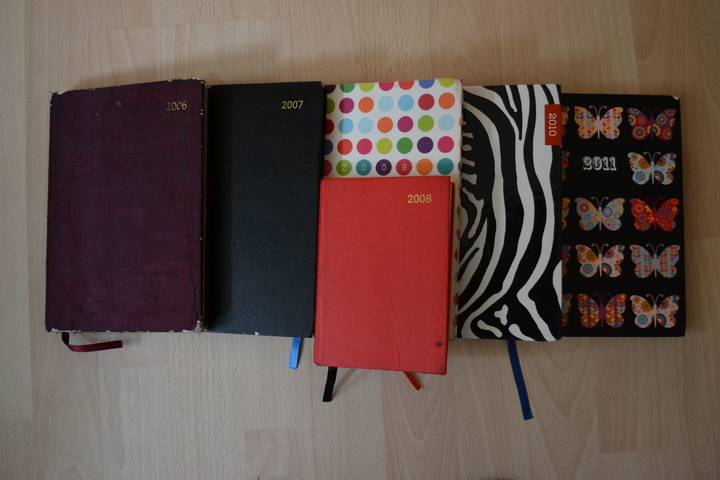 I think it was around the year 2000 when I decided how great it would be if I had my entire diary on computer, so I’d be able to search through it easily, and in case the original paper copies ever got lost or damaged. And so began what my incredulous mother dubbed “The Great Diary Digitisation Project”, as I worked my way through the years, typing in every single entry. (OK, OK… I freely admit I had no life back then and was probably borderline Aspergers!). It was a pretty massive task and I couldn’t always be bothered with it for long, so it took me about 3 years before I “caught up” with myself and had an electronic copy of everything. Over the next several years I managed to fall behind with the typing several more times, and at the start of 2012 I decided to stop writing a paper copy and just type it straight into the computer, which is what I’ve done ever since. So… yeah. 20 years worth of day descriptions feels like quite a lot of work, and in a way it seems sad that they’ll probably never be of use to anyone other than me. I considered starting a new blog at the beginning of 2014 and posting my diary entry from 20 years previous each day, but I didn’t have to read very far into 1994 to realise that could be a very bad idea! Then I thought “What if I anonymised it first?”, but it would be a hell of a lot of work to do that effectively. In any case, I doubt anyone would be interested in reading it. Most of my life hasn’t been particularly exciting, and at the same time it wouldn’t even have the “This is how a typical Scottish teenager lived in 1994” type of appeal, because I wasn’t a very typical teenager. New year’s day. Went to beach twice. Had meat but no beans. Fixed mixer. I won Countdown. which doesn’t mean a lot, but makes sense to me because I know that we always used to go to my granny’s house in Dundee for New Year, where we would walk her dog on the nearby beach, play her Countdown board game in the evening, and more often than not there would be several broken appliances waiting there for me to fix. (Though I did decide to clarify that it was New Year’s Day, just in case anyone reading didn’t know that the year starts on 1st January).